Our journey has hit a speed bump… nothing serious, just great weather to be outside doing something. Then there has been another minor detour making the rounds of on-demand self publishing options. I only allow myself a few hours a day in front of the monitor… so much to see, so little time. I have long been a fan of small press and self-publishing. It does my heart good to see how far the field has come with the advent of on-demand printing technology. So, i’ve squandered several hours of my computer time catching up on who’s doing what. As usual, the big fish are gobbling up the small ones and this week’s choice for a small, dedicated to authors, self-publishing assistant, next week becomes a sub of some conglomerate. Best wait ’til the manuscript is complete before committing. And beside, Free Will has generated some good discussion… seems like a good place to take a break. Thanks to all those who have joined in. Then the weather has been great here in New Mexico. That is, we have had some rain. It isn’t often that we get any rain this time of year. In our culture we talk about the past and future as if they were countries we could visit if we had the right ticket. Our fiction includes many examples of people and machines that travel back and forth in time. We obviously like to fantasize about the possibilities of time travel, but is it realistic? Is there really a physical place that is the past? The Universe, as we know it, is made up entirely of the present. You could say that the present IS the current state of the Universe. The entire System, from it’s largest galaxy down to the smallest individual atom, is in constant motion. A good deal of that motion takes place at, or near, the speed of light. These flying particles swirl around each other, forming giant cosmic storms that in turn swirl around their peers and swirl and swirl some more. In every nanosecond, this universal swirling produces a unique pattern of matter and energy that has never before existed. This “present” occupies space. The chunks of matter we see and the space between them clearly defines the concept we have of space. We could say the concept of time is also represented as a function of moving through space. Even at the speed of light it would take time to travel from one chunk of matter to another. But is time, as we perceive it, a real thing? The present occupies space, but does the past? Where is the physical reality of the past? You have an old rock. Is it the past? No, it is surely right here with us in the present. It is not the same rock that it was in the past. Wind and rain have turned some of it to dust. Some of it’s elements have decayed and released particles into the air. And all the time it is spinning and spinning, moving through the cycles of time. Where is the past? It exists only in memory. The past is a construct of imagination, it doesn’t really exist. It used to, but doesn’t anymore. The present continues to morph into more of the present, leaving nothing behind. Time/space only exists in the present. The past no longer takes up any time or space; the future has yet to occupy any. Although we are aware of them, the past and future are concepts that exist only in the mind. The past and future do not exist as a physical reality. However, the concept of the passing of time is absolutely essential for a mobile species navigating a dynamic environment. Movement in time/space requires a conceptual model that includes past, present and future as separate units. You have heard the expression, “Living in the now”. Why is that important? Because the present is the only reality there is. Everything else is pure imagination. Our imagination works so seamlessly with present reality that we sometimes forget that there is a difference. In order for robots to do meaningful work, they must be able to find and identify objects in a dynamic environment and use that information to achieve some goal or objective. Controlling this kind of “intelligent action” is the domain of Artificial Intelligence. Intelligence, artificial or otherwise, is essential for robots to function in the real world. Current studies in artificial intelligence and robotics outline quite plainly the feedback loops necessary to achieve effective navigation. Intelligence is applied to robotics in the design itself and in the algorithms stored in its memory. Each algorithm is a solution to a conceptual situation expected to be encountered, essentially stored intelligence. A modern robot can access a nearly unlimited number of intelligently written algorithms, but still have difficulty navigating a dynamic environment. What Artificial Intelligence is trying to find is a way to store wisdom. We are presently spending billions of dollars employing the some of the most sophisticated technology and intelligent people on the planet in an effort to build robots that can function effectively in the real world. It isn’t easy. Getting a machine to “make sense” out of raw data is tough, but progress is being made. However, one of the most difficult robotic tasks, the ability to navigate within a dynamic environment, is a skill possessed by every mobile species on the planet. We take it for granted, but our ability to navigate requires a highly complex system of recognition, planning and application of force. Although you and i have well developed navigation skills involving excellent senses and big brains, many tiny creatures successfully navigate their equally dynamic environments with much simpler equipment. Even the simplest robot needs to be able to process some basic information. It needs an internal clock to track time. It requires some senses to establish space. Before any navigation can take place, there must be some way to reference time and space. The same must be true of biological systems. Even the smallest single celled organism is going to need a mechanism to track time. If it can alter its course, it must also possess the ability to navigate. Just like a robot, to navigate, it must be able to reference time and space. Seems like a job for an information processing system that can stretch the instantaneous present into a sequence of events in time/space. To monitor these events requires a memory as well. In order to navigate, a course must be plotted in time/space, progress monitored and corrections made. If not the direct action of intelligence, that is surely the result of intelligently written algorithms. After all, the action we are referring to, the navigation of a dynamic environment, requires the referencing of time, recognition of a past and future, which we have already established as the domain of imagination and the mind. If single celled creatures don’t grasp the concept of past, present and future, the system that manages their behavior surely does. The more we grasp the concepts of wholeness and interconnectedness, the more we find that our concept of randomness is also in need of some revision. Without pattern or method is really just the opposite of the ordered universe modeled after an information processing system. From our individual point of view, the events that swirl around us seem to have no rhyme or reason. Our inflated ego considers anything it doesn’t understand as just another accident of blind nature. Of course, the more we learn about the environment and how it behaves, the more obvious it becomes that Nature is not blind, but all knowing. All events have a string of events leading up to them and a flock of events surrounding them in time. It is our mind that assigns a single name to events for ease of discussion. Close inspection has revealed that all events are controlled by their relationship to all other past and current events. No event stands alone and therefore only exists as a participant in the system or process. These concepts of wholeness and interconnectedness mean that nothing happens by accident. The concept of a structured universe precludes randomness altogether. The concept that the universe is managed by information leaves no room for random acts. What appear to be random events are those whose information channels have not yet been discovered. Computers cannot generate truly random numbers on their own. The reason is that a computer is an extremely precise machine. It operates by making very small and precise mathematical computations. Modern home computers can make billions of precise computations per second, without errors. When an error is encountered, the machine turns this impressive computational power loose on the problem. It employs highly sophisticated error correction routines that restore order to the system by finding and correcting those pesky errors. The computer thrives on precision and accuracy. A random number is an error by definition. There is really no way for a computer to select anything, but a precisely described number. So programmers have had to use “pseudo-random” number generator scripts to fake it. What most of them do is record the time the function is called as a random event. Then they use its numerical value as input to precisely calculate a number within the range specified. It will only accept one input per time slot, so by the time the second input gets in, the “seed” numbers have changed and they can meet the existing criteria for randomness, but a truly random number it is not. Triggered at a specific time, it will always generate the same “random” number. If scientists want what they consider truly random numbers, they use something like the decay of radioactive materials to generate them. The only thing random in a computer system is the occurrence of errors. So called random events can be devastating to important computer programs and modern computer technologies would not be possible without highly developed error correction routines. A close look at biological information processing systems reveals that they suffer from the same deficiency. Random events are errors to be corrected. Each cell performs only highly precise chemical operations dictated by highly robust and efficient coded instructions. Errors in the process itself are all but non existent. Damage to organisms is not caused by random events, but by broken and damaged input. Just as in a computer system, errors seem random to the system, but have a very real cause, such as scratches or dust on the media surface. Errors in biological systems come from damage to the information being fed to the organism. When fed the proper information, biological systems just do not fail. Errors do occur, but the immune system is very efficient in finding and eliminating damaged cells, while natural selection is equally efficient at eliminating damaged creatures. Randomness is just not a functional part of such a system. Randomness equals error. Every action within a biological system, is the result of “direction, pattern and method”. Nothing is left to chance. Looking at life from this point of view, the probability that random mutation controls the advance of evolution in biological systems is remote, indeed. Here is a term that shows our confusion with the concept of randomness. To choose is to select according to some criteria, while random means left to chance. To pull a number out of a hat can be random, but to choose an object over others is never random. Choosing is the exercise of free will and the very opposite of randomness. The process of choosing at random means that there are no criteria involved and all options have an equal opportunity of being selected. In discussions and writings of evolutionary theory there is a term i’ve come across a few times that points out more confusion. The term is “random mating”, and is used regarding transfer of genetic traits within a population. There is really nothing random about mating. All creatures that do it require very specific criteria be met before it takes place. The more complex the creature, the more complex is the mating ritual. Female birds, insects and animals of all kinds require their prospective mate to know how to sing and dance as well as protect her and her young from danger. She watches carefully as the male struts his stuff and chooses the one that best meets her criteria. Natural selection certainly plays a role in survival of genetic information, but selection by the female is far more important. The female is selecting for the future. She uses species specific markers to assess the male’s health, vitality and ability to protect her from her perceived threats and enemies. She is judging using criteria that have a connection to the male’s genetic information. She is only thinking of which suitor is the best choice, however, the result of all the female choices made over time produce a stronger species. Another advantage is that subtle and intricate behavior makes it possible for the species to isolate any deviates from the main colony. There was some landmark research done in the 70s with fruit flies that really needs to be looked at in the light of recent DNA discoveries. Back in those days, their criteria for a new species was whether or not it could mate with the old one. In the experiment, fruit fly populations were raised until there were 2500 individuals descendant from a single mating pair. At that time, another mating pair was selected and the remaining flies were destroyed. The new pair were parents to a new 2500 fruit fly family tree. They continued that cycle until the selected flies would no longer mate with the original population. According to the prevailing understanding of “species”, the researchers claimed success: they had caused mutations that produced a new species of fruit fly. Now we know that there were no changes in the DNA of the fruit flies, they were still exactly the same species. This new subspecies was isolated from the original colony, not by genetic mutation, but because of its behavior. This is a far better way to deal with adversity than risking it all by messing with the code. Instead of mutating DNA to find the solution to a serious problem, (the unexpected and repeated death of 99% of a population by an unknown cause), adjusting behavior is a rational first step in the search for an answer. By isolating the group with the mystery condition from the rest of the colony, the species protects itself while maintaining a possibly advantageous strain. This is the same first step we would take if an unknown agent was suddenly killing off large percentages of human families. We would quarantine them. The fact that biological systems also take this first step towards solution of the problem is lost on neodarwinists. The question is: how does the species “know” anything at all, and specifically, how does it know that 99% of this population has expired? The surviving pairs of fruit flies had no direct knowledge of the demise of the unchosen, as they were removed before the rest of the population was destroyed. However, they were connected holographically by virtue of their identical portions of DNA. When the 99% were gassed it caused a major disturbance in their shared coherent electromagnetic field. The surviving pair, as well as the rest of the species had a sudden emotional response, that terrible sinking feeling of dread, that coincided with the death of their comrades. This causes a rise in the anxiety level of surviving pair. It eventually makes them too nervous to mate with the rest of the colony, seeking out those with the same anxieties. The flatworms showed they could remember a direct trauma and pass the information around within their population. The fruit flies show that they can remember indirect trauma; that experienced by the species, but not the individual. Science tends to ignore it’s own findings when they don’t fit the currently accepted theory. That’s not a big deal, lots of things in life don’t seem to fit, but it would seem to me that they would pay more attention to anomalies, just because that’s the best way to debug anything. If you are in computer science you look to the anomalies. Those are the clues as to how to eliminate errors. That should be true all across the board, but get into biology and a lot of interesting bits get swept under the rug. It’s from a book called “Non-Human Thought”, by Graven, published in ’74. It took about 150 tries before the first flatworms learned that the light meant impending shock. The severed halves figured it out in about 100 tries. This is representative of a series of standard conditioning experiments done with flat worms that show how our nervous system functions. Granted that we have a far more complex nervous system than does the lowly flatworm, but the basic process is the same. This brings up the question: What is memory? In the flatworm experiment, they call the process “conditioning”. Whether you call it conditioning, adaptation or learning, the result involves some sort of memory. The organism remembers an event. It isn’t a vivid memory, but a vague sort of recall that intensifies with repetition. Each time the event happens the memory becomes stronger. The event is remembered as a sequence of events. The memoryof the flatworm identifies the light as the start of the sequence and acts accordingly. Here the lowly flatworm clearly spots the “difference that makes a difference” and initiates action in advance of the shock. Granted that panic wriggling is not a solution to the problem, but there isn’t much else a flatworm can do in a crisis situation. It does show us that the organism recognized the light as a warning that the shock would soon follow. The most important thing it tells us is that the memory of this “trauma” was recorded in the cells rather than in the brain, which only one end of the flatworm possessed. It also shows us a consistent pattern of learning behavior. Isn’t this the very same process we go through when we learn everything we do? We practice. Every time we repeat a behavior it gets easier. Our body has to learn the action, just the same way that our brain remembers something. They say our brain remembers by growing “pathways” in our gray matter. The more these pathways are reinforced, the stronger becomes the memory. Our muscles learn the same way. These pathways carry blood and neural signals to the cells. They “remember” the use patterns for the cells they service and are prepared to supply their needs. If the demands increase, the pathways are expanded as necessary. These pathways are the result of interference patterns created by the appropriate coherent electromagnetic field. The body has a copy that remembers what each muscle has to do and the brain has one that remembers what commands it has to give for the action to take place. The nervous system of the flatworm learns in the same way that our nervous system learns. This really fits with the concept of holographic memory, where each unit of memory contains the whole, but lacks detail. It is this vague pattern that is filled in by the details as the organism learns its new behavior. In further experiments, “educated” flatworms were minced and fed to worms that had never faced the light bulb and its shock. These worms also learned the reflex much faster than worms without any clues. What this tells us is that the information recorded in the memories of the minced worms was decoded by the digestive system and understood by the nervous systems of the “cannibal” worms. What form could a memory take in order for it to pass through the digestive system, be decoded and made available to the living creature? Thirty years and science has yet attempted to answer that question. Science is still trying to find memory in the brain. In that time scientists have carved up the brains of all kinds of creatures trying to eliminate their memory, to no avail. They have studied human subjects with damaged and/or developmentally retarded areas of the brain and found little or no correlation between specific locations of the brain and memory. On the other hand, the reports of transplant patients having memories related to the donors are legion. How else could this be possible? 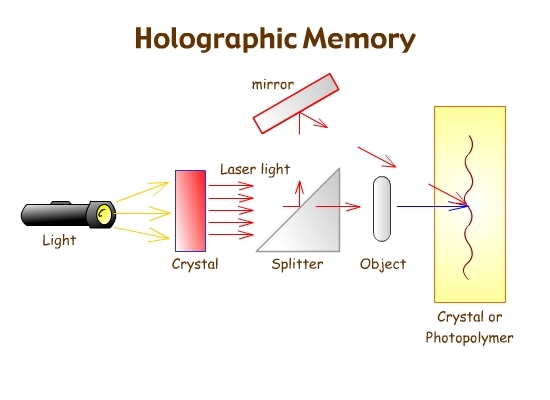 The model of a holographic memory is the only one that fits, yet it is hard to find a scientist that thinks so. In the case of the flatworms, their memory is a fact that can be proven by a repeatable experiment. The memory is passed by some natural process that we should be able to identify, but there doesn’t seem to be much interest from the scientific community. If we were operating a computer system and we found information being encrypted, secreted and passed in such a way, we would be forced to track down the pathways taken by the data and discover its source and destination. It is the job of the IT administrator to maintain the security and integrity of the system and this clearly represents a previously unknown breach of security. In biology there is no one looking after the integrity of the system they study. The current paradigm doesn’t recognize that the system is controlled by information. It ignores information pathways for the most part. When they find an obvious information pathway, they credit the chemical message carrier and ignore what it does for the system. I guess they still figure that it all runs on the magic of instinct and random encounters. This holographic view of the information channels of nature has been passed around for decades, yet the obsolete paradigm is still dominant.